Update on 05 Nov 2017: Here's what I thought about the stamp issue on the Chhatrapati Shivaji International Airport, Mumbai. The key issue was with the stamp design. These stamps were intended to celebrate 75 years of operation of the airport and not to showcase the new airport terminal. The stamp designer, obviously under pressure from the airport operator used images from Terminal 2, which was only completed in 2014. 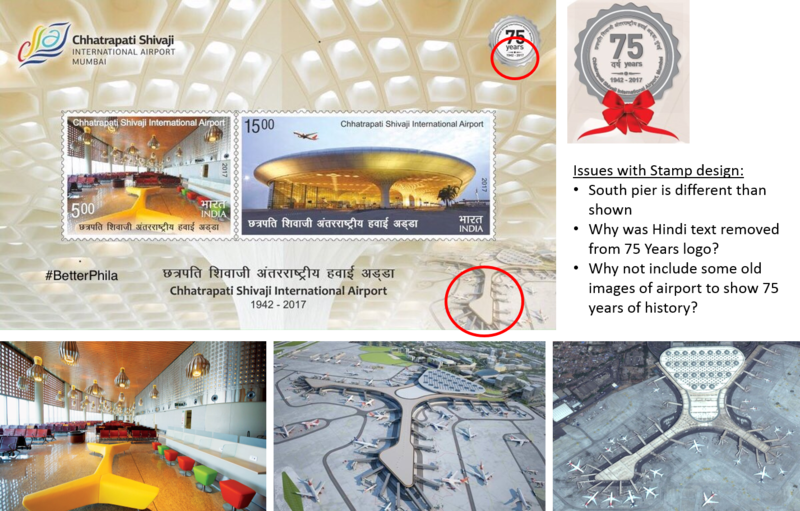 Even if only Terminal 2 images were planned to be used, and given that it's an operational airport teeming with passengers and airport staff, the stamps could have depicted the terminal and gates with people using the facilities. The souvenir sheet also shows the terminal schematic on the bottom right. I understand that it was only a graphical representation, but the south pier of the airport looks different than what's shown here. The logo used on the miniature sheet was also modified to remove the Hindi text from original. Lastly, why was the English title above the Hindi text? This is among the rare stamp issues where the English title is so prominent, when compared with the vernacular description. See the images below that show these oddities. My first recommendation for the stamp design would have been to expand this set to have at least 4 of the oldest operational airports shown on stamps. I'd have incorporated a transition from the oldest to the new terminal in a graphical manner (Civil aviation set from 2012 was a good design). In case of Mumbai airport, a glimpse of the Jaya He Museum could have been used more emphatically. Anyways, I was expecting more from the stamp designer, Brahm Prakash. Some of his designs (Metal Crafts stamps in 2016) were acceptable, but majority of them have been hit or miss. This was a missed opportunity, which could have led to creation of a simple set of 4 stamps with four different airports. Update on 29 Oct 2017: India Post had issued stamps in two designs on the Mumbai International Airport on 15th October. I will provide some details on the stamp designs and other information in the next few days. The south pier is different from shown as it is still work in progress. Hello - Due to unavailability of land, the south pier is not being constructed for now. Could you please go on Skycrapercity and read the thread on Mumbai airport? I understand it was a graphic representation, but why were the images not updated by CSIA? That's all. Thanks.